I think that if Big Sister E could do a craft or art project all day every day, she would never get tired of them. Whether I bring out crayons, markers, scissors, glitter or glue, she can't wait to start turning her concepts into reality. Who am I to stifle her creativity? Where I do have problems, however, is when the materials we're using end up... everywhere. As well as the obvious mess, have you ever tried looking to see what is in art supplies? On the website of one popular brand, when I went looking for ingredients I found the line "The exact ingredients of our products are proprietary," meaning they're not going to share their secret. So... they could be putting pretty much anything into my daughters' paints or dough, doesn't it? Considering the art ends up on my girls' hands, in their hair and even in their mouth, I'm not happy with that idea. The alternatives include not doing crafty projects anymore or finding a company that produces natural art supplies that kids love. Fortunately, I didn't have to look far when I was introduced to Clementine Art. 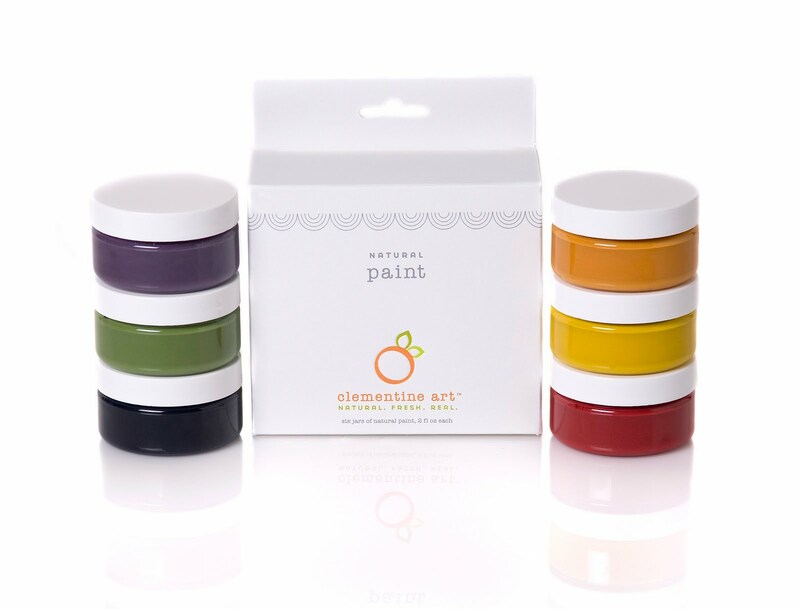 The first paint made with all natural ingredients and non-toxic mineral pigments, Clementine Art's Natural Paint comes in six bright colors and is long-lasting and fully washable. As well as being vivid, smooth and easy to use in their convenient individual containers, the list of everything contained in these paints is right on the package. If your child decides to put down their brush and begin finger painting, you'll never have to worry about any chemical dyes or additives ending up on their skin or accidentally ingested. Clementine Art is all about being natural, inspiring creativity and pledging to go green and I love that they have found ways to make traditional items like crayons and glue safer for children of all ages. 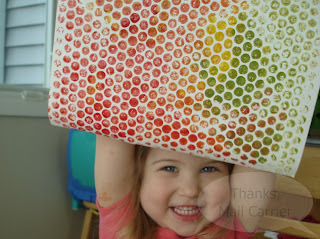 Not only that, Clementine Art has amazingly fun ideas as to what to create! As soon as I saw their great video showing a bubble wrap print-making project, I knew that Big Sister E would be overjoyed to try it. 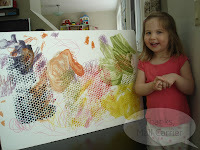 First, I gave her a sheet of bubble wrap and Clementine Art Natural Paints and let the imaginative painting get underway. When the bubble wrap was sufficiently painted, we laid a sheet of white paper on top of it and rubbed it a few times with our hands. Slowly peeling back the paper revealed that this truly was one of the easiest and most fun art projects that we had done in a while. Big Sister E definitely agreed. The rest of the morning was filled with originality and ingenuity, all thanks to Clementine Art. By combining the Natural Paints with the Natural Markers that they sent us, Big Sister E was able to create what she called "My Masterpiece." And the entire time that she was being artistic, I sat back and reveled at her enjoyment and my ease of not having to wonder if her fingers were soaking up strange chemicals. When it came time to clean up, any paint or marker spots washed easily away and after the colors dried on our artwork, they were still bright and beautiful. Plus, due to the unique packaging and containers of the paints, we didn't end up with sticky, drippy bottles to pack away like we usually do. This is a great product from start to finish! 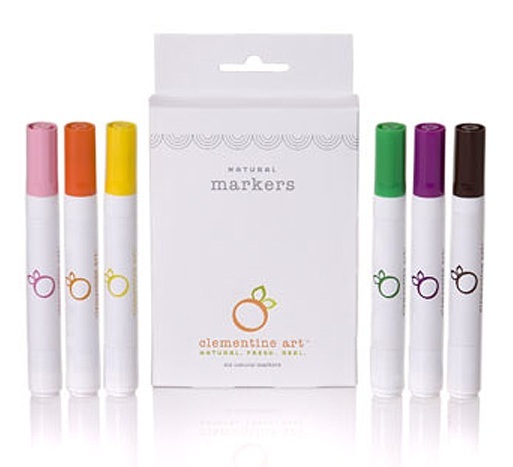 For high quality art supplies that you can feel good about, Clementine Art has it all. Their all natural, non-toxic and environmentally-friendly products and packaging not only support the development of children but of a healthy earth. The Nitty Gritty section of their website, including the Ingredients Glossary, impresses me every time I visit and learn more about their wonderful values and specific items that are included in each product. This is a company that truly cares and the result of that is shown in the amazing items they offer. 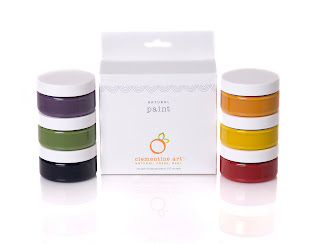 One lucky person will win a set of Clementine Art's Natural Paint! ARV $12! To enter to win: Visit Clementine Art and tell me which of their amazing products (other than the ones listed above) sound like fun to you. 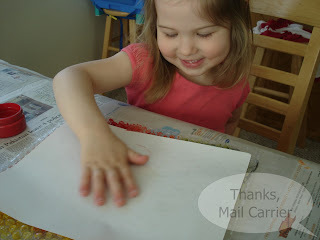 3 Extra Entries if you blog about this giveaway linking back to Thanks, Mail Carrier and Clementine Art. Please leave an address where it can be found. Giveaway will end on June 10th at 11:59pm CST. Do me the favor of leaving an email address or making absolutely sure it is visible in your profile, I have to have a way to contact the winner. The winner will be chosen by random.org and announced here as well as emailed and will have 48 hours to contact me or respond to notification or a new winner will be chosen. This giveaway is open to U.S. residents only. A big thank you to Clementine Art for providing Natural Paints and Natural Markers for me to review as well a set of Natural Paints for one lucky giveaway winner. The opinions shared are my own and honest and if you really need to see more, click here to see how I roll. I'm a follower with google friends. I love the modeling dough!! I would love to try the Modeling Dough! I'm a facebook fan of Clementine Art. I love the natural soy crayons! I'm going to buy some for my son's birthday in a few weeks! The natural modeling dough looks fun. The modeling dough and soy crayons would sure be a hit with my daughter! I would love to have the Natural Markers! I have boys and they love using glue. I like the Natural Markers. I love to try the Soy Crayons. I would like to try out the natural molding dough! Left a comment on Clementine Arts Facebook page. The soy crayon rocks would be great for my little guy. 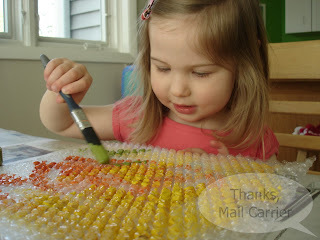 Thanks for the great idea of painting with bubble wrap - very cute! I would love some glue and modeling clay. I would like to get the modeling dough. I've entered your Eleven Collection giveaway. I've entered your Princess Couture Designs giveaway. I've entered your Digital Photo Keychain giveaway. I've entered your Sophisticated Baby giveaway. I've entered your Double Print Ceramic giveaway. I've entered your CSN Stores giveaway. I've entered your Yoga Mat giveaway. the crayon rocks look fun! I've entered your ZooShoo giveaway. I've entered your Little Girls Collection giveaway. I've entered your DownEast giveaway. Natural Soy Crayons would be nice to have! I'm following you and tweeted! I entered the Eleven Collection giveaway. I entered the Princess Couture Design giveaway. I entered to win the Double Print Ceramic keepsake. I entered to win the ZooShoo shoes! I am following you from MBC, "Under a 100 Followers" group. I am hoping when you get a chance you can follow me back at http://www.britneysbeautyblog.com and http://www.britneysbeautymark.com. The Soy crayons look great for little hands!